Virtual Private Networks or VPNs are very popular amongst privacy conscious users or those who are looking to unblock certain country specific websites. Unlimited VPNs usually cost a lot while the free ones have their own “hidden” costs. To make it all simple and easy, Opera has integrated a free and unlimited VPN solution for its users. VPNs make it difficult for anyone to track you by routing traffic through other countries. This enables anonymity and can be used to access geo-restricted content like watching American Netflix programs in Pakistan (though it won’t be possible for much longer). Opera users will no longer require extensions or separate software to use a VPN. The company explains that bringing this privacy tool marks another step in building a browser suited for 2016. It hasn’t been long since Opera integrated a native ad-blocking solution to their browser, another first for any major desktop browser. According to Global Web Index more than half a billion people (24% of internet users) have tried or used a VPN service. 38% of those use it for entertainment purposes, 30% use a VPN to stay anonymous, 28% use VPN service to access restricted content and 27% use it at work. Opera used this information to launch their new free service and shape their VPN accordingly. To activate the VPN feature, Windows and Linux users need to go to “Privacy and Security” section in “Settings” and enable VPN option there. Mac users can go to preferences and toggle the VPN feature. Enabling VPN adds a button to the browser address field letting users view and edit their VPN location, check IP address’s invisibility review their data statistics. 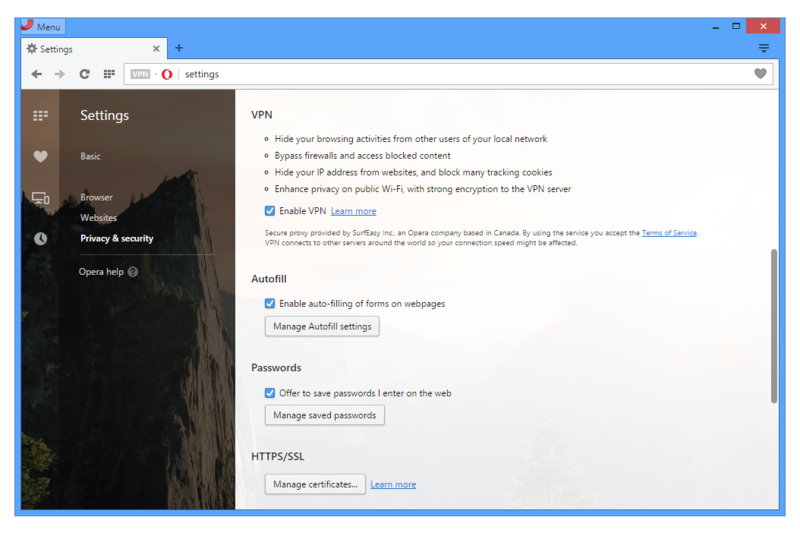 Opera says Hiding IP address, unblocking firewalls and public WiFi security are features seen in premium VPN solutions, however, Opera users get them for free. The only bad news is that the feature is still in Developer Preview stage. In other words, the stable channel will get the update in about four to six weeks. Other additions include a video popup feature, custom theme creation, support for personal ad blocker list and some Speed Dial improvements. The developer version of Opera can be downloaded here. It’s time to think about making Opera the primary browser. your comment … DUH ! You have to download the developer version of Opera not the stable one. Then go to Settings > Privacy > Enable VPN. u sure its completely free ? Unrestricted p*rn . . . . err! I mean unrestricted internet. this is Fantastic IF its totally free without any darned strings attached.